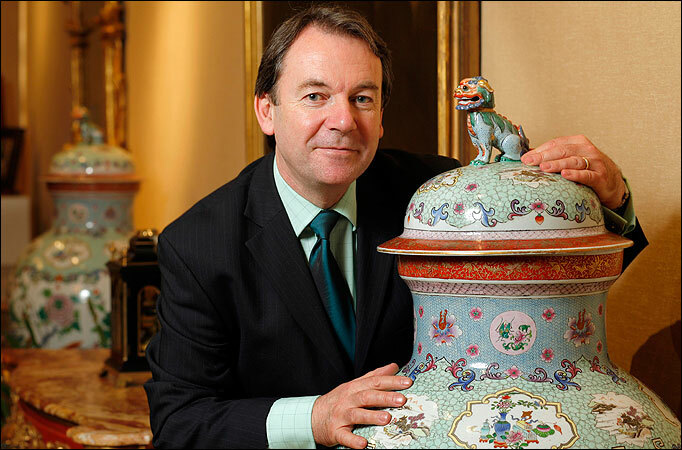 Eric Knowles and his expertise in antiques makes him a fantastic spokesperson, with great credibility and entertainment. His passion and great interest in the subject also makes him a very confident spokesperson. Below is an example of an interview he recorded with BBC Norfolk about the treasure you may be holding in your home. If you're interested in a TV personality spokesperson for any radio or TV interviews please get in contact with us. Eric Knowles - a leading authorityIn 1985, he was offered a full directorship at Bonham's. As a Fellow of the Royal Society of Arts, Eric Knowles has become a leading authority in the following fields: European and Oriental Ceramics from the Seventeenth to the Twentieth Century; the glass of Tiffany and Lalique; and Nineteenth and Twentieth Century Decorative Arts. Today he looks after museum liaison and several of his finds can now be seen in national museums. Since January 2009 Eric has since become independent of Bonhams and offers his own valuation service. Whilst employed there he was responsible for museum liaison. Eric is presently to be seen on BBC2’s most popular programme ‘Put your money where your mouth is’ and alongside Sandi Toksvig on ‘Antique Master’ searching for the UK’s top amateur antique expert. Other appearances include The Twentieth Century Roadshow, Crimewatch UK, Going For A Song, The Great Antiques Hunt and The Antique Inspectors. He was a contestant on Celebrity Mastermind Christmas Special in 2004 where he narrowly missed winning the trophy by 2 points.